Kang Kek Iew when he was aged 17. Since his childhood, Kang's name has been changed many times. One such occasion of name changing took place when he was 15, when his parents changed his name to Yim Cheav. As the name is important in Chinese culture, Kang therefore gave his name to his grandson, and what is really significant is that he added the Chinese name "Yun" to this name. He was described by his former classmates as a bright and quiet boy who rarely smiled during his youth. In 1964, Kek Iew began studying for his teaching certificate in Mathematics, a subject he loved, at the Institut de Pédagogie. The Institute was a cradle of activism under the directorship of Son Sen who was later to emerge as the Defence Minister of the Khmer Rouge and Duch's immediate superior. On 28 August 1966, Kek Iew received his teaching certificate and was posted to a lycée in Skoun, a small town in Kampong Cham Province. He was a good teacher, remembered as earnest and committed by his pupils. [page needed] He joined the Communist Party of Kampuchea in 1967. Following the arrest of three of his students, he fled to the Khmer Rouge base in Chamkar Leu District where he was accepted as a full member of the Communist Party of Kampuchea. A few months later, he was arrested and witnessed others being tortured at the Prey Sar prison[page needed] by Norodom Sihanouk's police for engaging in communist activities. He was held without trial for the next two years. In 1970, when he was released following the amnesty granted to political prisoners by Lon Nol, he joined the Khmer Rouge rebels in the Cardamom Mountains bordering Thailand. Communist groups in France's former colonies in Indochina borrowed the French World War II expression 'maquis' when referring to their resistance movements in the jungles. In the zone under the control of the Khmer Rouge, Kek Iew took on his nom de guerre Comrade Duch (IPA:[dujc]) and became a prison commandant. He was appointed the head of Special Security by his immediate superior Vorn Vet. In the forests of Amleang, Thpong District, Duch set up his first prison, code-named 'M-13'. Two years later, he also established a second prison 'M-99' in nearby Aoral District. Assisted by his two deputies, Mam Nai (Comrade Chan) and Tang Sin Hean (Comrade Pon), Duch began perfecting his interrogation techniques and the purging of perceived enemies from the Khmer Rouge ranks. Prisoners at these camps, mostly from the ranks of the Khmer Rouge, were routinely starved and tortured to extract real and made-up confessions. While in the maquis (secret forest), Duch married Chhim Sophal, aka Rom, a dressmaker from a nearby village. They had four children while he worked at S-21. After the Khmer Rouge victory in April 1975 Duch and his men set up prisons throughout the capital including the infamous Tuol Sleng prison. Duch's request for a transfer in May 1975 to the Industrial Sector of government was denied. The Tuol Sleng prison camp was initially headed by In Lon aka Comrade Nath with Duch acting as deputy. [page needed] Subsequently, In Lon was transferred and Duch promoted to be the Director. By May 1976 all the prisons in Phnom Penh were consolidated and relocated to Tuol Sleng. Prisons like Tuol Sleng were created to cleanse the population of suspected enemies of the revolution. In Tuol Sleng Duch ordered the execution of prisoners after their interrogation was completed. For example, on a list containing the names of 17 prisoners (eight teenagers and nine children), he wrote the order “Smash them to pieces.” On a longer list of detainees, his annotation reads “smash: 115; keep: 44 persons.” The text below this annotation reads “Comrade Duch proposed to Angkar; Angkar agreed.” On a list of 20 female detainees, Duch wrote annotations for each of them, ordering: “take away for execution,” “keep for interrogation” or “medical experiment". At least 100 detainees died after having all of their blood drawn for transfusions for wounded soldiers. Surgical operations were also performed on detainees in order to train medical staff. Duch impressed his superiors with his work and was appointed the head of Democratic Kampuchea's dreaded "special branch": the Santebal. As the party purges increased towards the end of the Democratic Kampuchea period, more and more people were brought to Duch, including many former colleagues including his predecessor at Tuol Sleng, In Lon. Throughout this period, Duch built up a large archive of prison records, mug shots and extracted "confessions". On 6 January 1979, he was ordered by his superior to kill the remaining prisoners. The next day Duch was amongst the last Khmer Rouge cadres to flee Phnom Penh after it fell to the Vietnamese army. Though he was unable to destroy much of the prison's extensive documents, he saw to the execution of several surviving prisoners before he fled the city. In 1995, his wife was killed under mysterious circumstances in an attack on his home. Duch was the only witness and suspected Pol Pot of instigating it. He sold all his possessions, secured a transfer to Svay Chek College, and moved there with his children. Shortly after his wife's murder, Duch began attending the prayer meetings of the Golden West Cambodian Christian Church held in Battambang by Christopher LaPel, an evangelical Khmer-American. Duch was baptized by LaPel and eventually became a lay pastor. [page needed] LaPel was later to observe that although he did not know Duch's real identity at the time, there were clues. For example, before his conversion, Duch had said to LaPel that he had done a lot of bad things in his life. Later, Duch was to say, "I don’t know if my brothers and sisters can forgive the sins I've committed against the people". Soon after his identity was discovered, Duch accepted a transfer to Samlaut as Director of Education. When fighting broke out in 1996 following the split of the Khmer Rouge and the coup to oust Prince Rannaridh in 1997, he fled with his family to the Ban Ma Muang camp just inside Thailand. At the camp, he worked for the American Refugee Committee as the Community Health Supervisor. In late 1998, he returned to Cambodia when fighting subsided. He settled in the village of Andao Hep in Rattanak Mondul and worked closely with World Vision International, the Christian relief agency. The photojournalist Nic Dunlop tracked Duch down in Samlaut. In 1999, Nate Thayer, who had previously interviewed Pol Pot and Ta Mok, and Dunlop interviewed Duch for the Far Eastern Economic Review. Duch surrendered to the authorities in Phnom Penh following the publication of his interview. Kang before the Extraordinary Chambers in the Courts of Cambodia on 20 July 2009. He was responding to the testimony given by his former subordinate Him Huy who was a Khmer Rouge prison guard. On 31 July 2007, Duch was formally charged with war crimes and crimes against humanity and detained by Cambodia's United Nations-backed Extraordinary Chambers in the Courts of Cambodia. Duch, represented by Cambodian lawyer Kar Savuth and French lawyer François Roux, appealed against his provisional detention by the Extraordinary Chambers in the Courts of Cambodia based on the more than eight years he spent without trial in Cambodian military detention. The appeal was unsuccessful and on 14 August 2008, the tribunal issued its indictment after completing their investigation of Duch. In February 2008, as part of the judicial process, Duch was taken to Tuol Sleng prison, the scene of his crimes. He reportedly collapsed in tears after stating, "I ask for your forgiveness – I know that you cannot forgive me, but I ask you to leave me the hope that you might." On 16 February 2009, the UN supervised trial of Duch began at a Phnom Penh court. Duch was prosecuted by international co-prosecutors William Smith and Anees Ahmed and was charged with "personally overseeing the systematic torture of more than 15,000 prisoners." The presiding judge of the case was Nil Nonn. Duch was tried by a panel of five judges — three Cambodian, one French and one New Zealander — according to a 2003 pact between Cambodia and the United Nations establishing the tribunal. 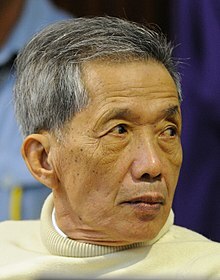 On 31 March 2009, Duch, in a statement in front of the Cambodia tribunal, accepted responsibility for torturing and executing thousands of inmates, expressed "heartfelt sorrow" for his crimes and vowed to cooperate fully with the tribunal. Duch surprised the tribunal on 27 November 2009 with a plea to be released. In his final statement before the tribunal he acknowledged his involvement in Khmer Rouge-era crimes, including the execution of more than 12,000 Tuol Sleng prisoners, but said they were committed by a "criminal party". Duch also noted that he had served more than 10 years in detention, and stressed that he had been fully cooperative with the tribunal. There were also conflicting closing arguments from Duch's defense team. His Cambodian lawyer, Kar Savuth demanded his client’s acquittal and release, while his international counterpart, François Roux pressed judges to hand down a lenient sentence. At the conclusion of the trial, prosecutors asked that Duch be given 40 years in prison if convicted. On 26 July 2010, Duch was found guilty of crimes against humanity, torture, and murder; he was sentenced to 35 years imprisonment, with a pre-trial detention credit of 11 years being applied to his sentence and an additional controversial five-year deduction because his period of pre-trial detention exceeded the maximum allowed under Cambodian law. On 3 February 2012, an upper court U.N. war crimes tribunal rejected his appeal and extended his sentence to life in imprisonment because of his "shocking and heinous" crimes. This ruling is final with no other chance for appeal. On 20 October 2018, he was hospitalized in serious condition. ^ Totten, Samuel; Bartrop, Paul Robert; Jacobs, Steven L. (2008). Dictionary of Genocide: A-L. Greenwood Publishing Group. p. 82. ISBN 978-0-313-34642-2. Retrieved 12 October 2010. 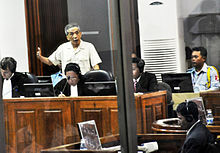 ^ a b "Landmark Khmer Rouge trial starts". BBC News. 17 February 2009. Retrieved 17 February 2009. ^ "Propaganda, Torture and French Colonial Heritage: Looking into the Methods of the Khmer Rouge - Cambodia Tribunal Monitor". www.cambodiatribunal.org. Retrieved 25 November 2018. ^ "CBIO Record of Comrade Duch". Yale Cambodian Genocide Program. Archived from the original on 24 November 2007. Retrieved 18 December 2005. ^ a b The Scene of the Mass Crime: History, Film, and International Tribunals. p. 163. ^ a b c d e f g h Nic Dunlop (2005). The Lost Executioner – A Journey into the Heart of the Killing Fields. Walker & Company, New York. ISBN 0-8027-1472-2. ^ The Scene of the Mass Crime: History, Film, and International Tribunals. p. 164. ^ Kamm, Henry (1998). Cambodia: Report from a Stricken Land. Arcade Publishing. p. 140. ISBN 1-55970-433-0. ^ "Mam Nay : « Je ne sais pas, je ne me souviens pas » « Procès des Khmers Rouges". proceskhmersrouges.net. Retrieved 6 December 2017. ^ ppp_webadmin (24 November 2009). "Contrition all a sham, victims say". Retrieved 6 December 2017. ^ "Anatomy of an Interrogation: The Torture of Comrade Ya at S-21". 2 November 2007. Retrieved 6 December 2017. ^ a b Delage, Christian; Goodrich, Peter (2013). The Scene of the Mass Crime: History, Film, and International Tribunals. New York: Routledge. p. 147. ISBN 978-0-415-68894-9. Retrieved 7 October 2015. ^ Lim Phalla. "Duch's confession and apology". Archived from the original on 3 April 2009. Retrieved 31 March 2009. ^ "Tuol Sleng Organizational Chart". Yale Cambodian Genocide Program. Retrieved 18 December 2005. ^ Paterniti, Michael (1 July 2009). "Never Forget". Retrieved 6 December 2017. ^ "Photo: Leaders/Kaing-Guek-Eav". Dccam.org. Archived from the original on 12 July 2010. Retrieved 27 July 2010. ^ a b Ker Munthit (12 August 2008). "Cambodian tribunal indicts Khmer Rouge jailer". USA Today. Associated Press. Retrieved 12 April 2012. ^ Francois Bizot (17 February 2009). "My Savior, Their Killer". The New York Times. ^ Grant Peck (31 March 2009). "Khmer Rouge defendant expresses 'heartfelt sorrow'". Associated Press. Retrieved 3 December 2009. ^ Robbie Corey Boulet (27 November 2009). "Duch asks to be set free". Phnom Penh Post. Retrieved 3 December 2009. ^ Kong Sothanarith (29 March 2010). "Verdict Expected in June for 'Complicated' Duch Case". VOACambodia.com. Retrieved 16 April 2010. ^ Miranda Leitsinger, "Cambodia's Duch sentenced to 35 years", cnn.com, 26 July 2010. ^ 26 July 2010. "International Law Prof Blog: First Sentence Issued by Extraordinary Chambers in the Courts of Cambodia". Lawprofessors.typepad.com. Retrieved 27 July 2010. ^ Mark Vlasic, "Life for Comrade Duch, a milestone for international justice"
^ "Commander of Khmer Rouge's most notorious prison in intensive care in hospital". Retrieved 25 November 2018. ^ "Ex-Khmer Rouge jailer hospitalized in serious condition". Retrieved 25 November 2018. ^ "Duch hospitalised in Phnom Penh - Khmer Times". 23 October 2018. Retrieved 25 November 2018. Wikimedia Commons has media related to Kang Kek Iew.